Notes: Fits LS1/LS6 engine models with spark plug wire and coil connector entering the same side of the coil. Please see application notes regarding engine VIN and fitment. Click the "Charts & Guides" tab for help with coil identification. 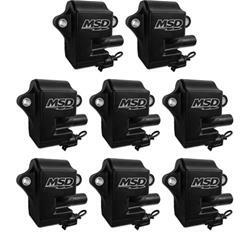 All specifications listed are measured at 14 V.
MSD Ignition's Multiple Spark Coils (MSC) will fit in place of the stock GM LS coils and connect directly to the factory connectors. Once installed, you'll have the power and performance of higher energy sparks, crowned with MSD's multiple spark discharge. Increased spark energy and voltage, along with multiple spark capabilities, help improve the combustion process of the fuel mixture to create an efficient burn. This results in improved throttle response, smooth idle and quick starts, plus increased high rpm performance!